According to the book ‘The Story of the Raleigh Cycle’, the Irish government launched its ‘Industrial Programme’ in the thirties to encourage firms to employ local labour. 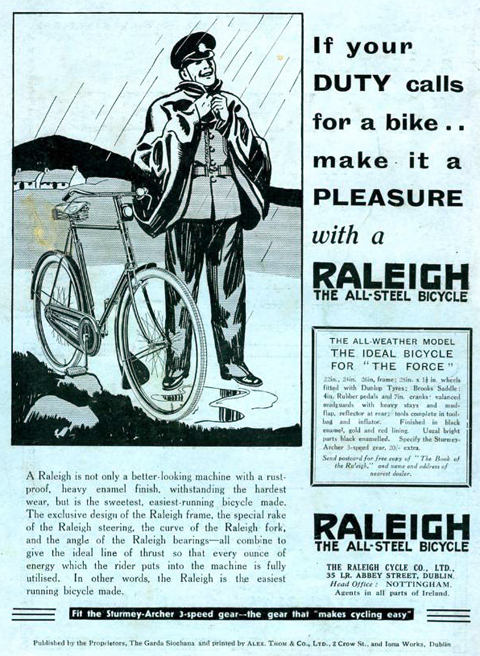 So Raleigh formed the Irish Raleigh Cycle Co Ltd in October, 1936 – ‘though its factory was only really an assembly plant and did not actually manufacture bicycles. The factory became operational early in 1937 and an average of 1000 machines per week were put together there until the outbreak of the Second World War.’ The factory resumed production after the war. This 1938 Irish Raleigh X Frame is an older restoration, with its metalwork repainted over twenty years ago. The transfers (decals) on the chaincase and rear mudguard are intact. It has the ‘heron’ head badge (which Raleigh introduced in 1928). The chrome parts (handlebar, wheels, pedal cranks) are shiny. The saddle is rare, being the heavy duty ‘Model B90/3’ supplied directly by Brooks to Raleigh, with Raleigh’s logo stamped into the top of the leather. (Most surviving examples of these have black leather and are from the 1950s). The machine is in good mechanical condition and is ready to ride.